Posted September 16, 2015, in Student Alumni. Reid graduated from Rutgers-Camden with a psychology degree. He worked as a project assistant with the South Jersey Strengthening Families Initiative. 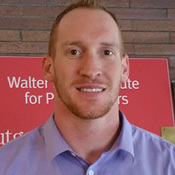 Outside of the Walter Rand Institute, he completed a project under the direction of Dr. Kristin August examining the psychosocial factors related to successful diabetes management. Reid plans to pursue a doctoral degree in clinical psychology with an emphasis in health. Page last updated by Senator Walter Rand Institute for Public Affairs at 3:54 pm May 11, 2017 . This page was printed from http://rand.camden.rutgers.edu/2015/09/16/hlavka-reid/ at 5:08 PM Monday, April 22, 2019.